Since October 2008, the United Nations celebrates the International Day of the Rural Woman annually. This year, I had the opportunity to celebrate this date with a broadcast on “Gullah/Geechee Riddim Radio” entitled “Gullah/Geechee Rural Ooman Feedin de Famlee” (http://www.blogtalkradio.com/gullahgeechee/2013/10/21/gullahgeechee-rural-ooman-feedin-de-famlee). Each year the day is to acknowledge “the critical role and contribution of rural women, including indigenous women, in enhancing agricultural and rural development, improving food security and eradicating rural poverty.” So, as I pondered this, I could continuously see my mother and I and other women that I grew up around and with on St. Helena Island, SC in the Gullah/Geechee Nation out in the fields and working on the farm. I could also see women casting nets on low tide in the creeks. As I pondered the images that came to mind then took a ride down the road, I saw women still doing these things. Yet, the role that we play in eradicating poverty is not usually acknowledged. 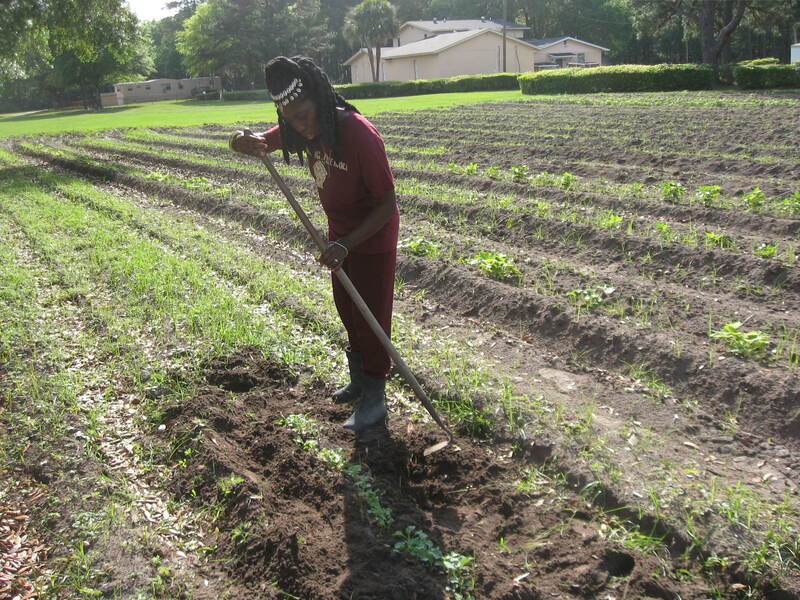 Queen Quet works in the fields the traditional Gullah/Geechee way. E da mama fa tru wha be de one wha mek sho dem chillun gwine school an e mek sho e gwine wid de bellee full. De mama wan dem chillun fa do betta din e be dun do. So, e wan mo fa e chillun an e wok fa mek sho e chillun hab mo. The land rights issues within the Gullah/Geechee Nation are consistently spoken of as they relate to entire families. I am accustomed to Gullah/Geechee men that respect the wisdom of the women in their families and the community. I have also seen numerous women play the central role in insuring that the money was amassed to pay the taxes on the land each year. I have seen them hold the money in the mason jars and put away the funds to insure that there would be no issue when the tax time came. I have seen them fight for land that they inherited out of respect to their family legacy and to insure that their children’s children’s children would have land on which to continue that legacy well into the future. Part of that legacy on Gullah/Geechee Nation land has been teaching the family how to maintain the land, how to farm and harvest the land, and how to identify the fruit trees, berry bushes, and healing herbs on the land. All of these things have kept the family healthy so that they can have the strength to continue to carry on. Although de Gullah/Geechee ooman ain da tek paypa fa mark doung de land waat, e kno e value fa tru! The women are able to economically empower the family by being able to sustain themselves and the family on and from the land. The economic stability of the family tends to help further the advancement of the members of the family. So, this International Day of Rural Women, I chose to salute de Gullah/Geechee rural ooman because I have been a party to the theme: “Claim your right to dignity and education.” The education that we received at the apron strings of the rural Gullah/Geechee mothers and grandmothers over the generations is greater than all the degrees that I hold and I am sure that many other Gullah/Geechees would agree. Gullah/Geechee rural women hold their heads high as they balance what seems to be the world in baskets and buckets. Our elders and foremothers always told us never to look down, but to keep our heads up. This is a body language that already conveys dignity. So, as I again reflect on all that the Gullah/Geechee rural woman has done to advance the family and eradicate economic and spiritual poverty, I must say to my foremothers, mother, and de oda Gullah/Geechee ooman wit muddawit, “Tenki Tenki!” Keep holdin pun de land!